Very pleased to see a Hexham volunteer among those honoured by the Queen in the New Years honours. Mary Robinson, from Hexham, has volunteered for the British Red Cross for more than 50 years around the North East. Each year she dedicates about 1,000 hours of her time to helping those in nearby communities and further afield. Mrs Robinson spoke to the BBC saying it was "such an honour" to be recognised. She said: "I was so surprised when the letter arrived, and as I read it I thought, 'This can't be for me'. Then I cried. "I never thought I would ever receive anything like this, so I am shocked and delighted. "But I could never have done anything without the support of the other members and my family." Congratulations to Mary and her family on his fantastic honour. Dr Cunningham, a GP at Corbridge Health Centre is also honoured for his services to primary care. Contragulations to him everyone else honoured by her Majesty. Trevor Mann, the senior vice president for manufacturing at Nissan Europe, is honoured for services to business in North East England. The University of Sunderland's vice-chancellor, Prof Peter Michael Fidler MBE. Prof James George Steele, Dean at Newcastle Dental School, is honoured for services to dentistry and oral health. Durham Chief Constable Thomas Jonathan Stoddart, from Whitley Bay, who has previously received the Queen's Police Medal, is honoured for services to the police. Stephen Bell, from Newcastle and chief executive of Cyrenians, is honoured for services to homeless people. Paul Bidwell, an archaeologist from North Shields, is honoured for services to heritage. June Elizabeth Foster, from Consett, head teacher of Moorside Community Primary School and the Arthur's Hill Federation in Newcastle, is honoured for services to education. Christine Haddock, from Durham, who is the head teacher of Larkspur Community Primary School, Gateshead, is honoured for services to education. Julie Anne Luther, from Durham, who is the clinical director at HMP Frankland, Ministry of Justice. Linda Moore, from Newcastle, group director and vice-principal at Newcastle College, is honoured for services to further education. Prof Ella Ritchie, deputy vice-chancellor of Newcastle University, is honoured for services to Higher Education. Arthur John Row, from Blyth, who is Deputy Pension Centre Manager, at the International Pension Centre, Pension, Disability and Carers Service, Department for Work and Pensions. Prof Stephen James Singleton, medical director and regional director of public health, NHS North East in Newcastle, is honoured for services to public health. Dorothy Margaret Best, from Newcastle, a physical education teacher and school sports volunteer in County Durham, is honoured for services to physical education. Ian Crampton, from Carville near Durham, is honoured for services to national and local charities. Anthony John Gray, from Newcastle, is honoured for services to the voluntary sector in Northumberland. Sally Hancox, from Durham, is honoured for services to reducing carbon emissions and fuel poverty in social housing. Dorothy Hardy, from Newcastle, a national park voluntary ranger, is honoured for services to conservation. Julie Lightfoot, from South Shields, a managing director at Solar Solve Marine, is honoured for services to international trade. Joan Little, executive officer from Houghton-le-Spring, is honoured for her work with the complaints and appeals directorate, child maintenance and enforcement commission, Department for Work and Pensions. Gustav Macleod, from Chathill in Northumberland, chairman of governors at Thomas Bewick Special School, Newcastle, is honoured for services to education. Derek Edward Thomas Nicholson, from Newcastle, chairman of governors for Cramlington Learning Village; governor of The King's School, Tynemouth, and the Registrar Emeritus at Newcastle University, is honoured for services to education. John Damian Waugh, from Chester-le-Street, chairman of governors at Our Lady Queen of Peace School in Tyne and Wear, is honoured for services to education. However, all is not rosy in the state of racing - as the BBC Racing Correspondent writes - naming the efforts of myself and Matt Hancock MP to bring racing into the 21st Century in the House of Commons. Best coffee / tea shop: Mucho Gusto in Hexham; follow them on Twitter - who says our coffee and tea shops are not up to date? A coffee shop that does all the basics really well. Best Cheese Scone: this is a dangerous call for any Northumbrian to make as there are so many contenders but the lady who runs The Old Church B+B at Chollerford is amazing at baking - ate too many of her scones when I walked past on the walk. Local champions: for their effort for local causes without reward - Tom Martin, chair of Wylam Parish Council, East Tynedale Olympics and so much more, and the fascinating Robert Forsythe, who works tirelessly in Prudhoe - both would be good Local County Councillors, given the amount of public work they do. Great news, as reported in the Manufacturer Magazine, and elsewhere: SCA, the biggest employer in Prudhoe, has created more than a dozen jobs and is expanding its apprentice scheme, after switching its European production to Prudhoe. The company is a model employer - and whilst I am pleased with the investment, you cannot overstate how much of a community based company SCA is - it does so much for the local area. It's apprenticeship scheme is second to none. The investment is in the production line, enabling the company to produce Tork zigzag-folding paper towels in the UK for the first time. 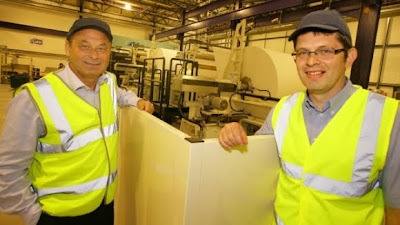 Tony Richards, [who lives locally, and is on the right in the picture], and who has responsibility for the Prudhoe factory and site, said: “We are delighted that Prudhoe Mill has won this investment which helps to provide new employment, safeguards existing jobs and gives support to the local economy. The company has also recently established a Graduate Accelerator programme, a scheme which guides engineering graduates through a two year development programme. Earlier in the year SCA was named by Vince Cable as one of the UK’s top 40 manufacturing sites. FANTASY: I know this is a wishlist too far, but it is worth a try..
- Score a century at Lords, or even play there! I am pleased that the PM has taken the campaign of Dr Sarah Woolaston, MP, and a multitude of other doctors and medical professionals seriously, and does intend to copy the Scottish and other countries examples on alcohol pricing. I spoke about this in the alcohol pricing debate in the House of Commons shortly before Christmas [scroll down the blog to see the debate or They work for you]. My desire is to protect pubs, who are the lifeblood of our community and where drinking is done safely, whilst trying to alleviate the problem of cut price strong alcohol which is widely available in the our supermarkets. It is not a ban but is a sensible, medical backed approach, which should be welcomed. There is evidence to show that alcohol consumption in the UK has soared since pricing dropped - with a consequential effect on violence and Hospital A & E's.
" In 2006, in England, there were 6,517 deaths directly linked to alcohol, of which two thirds were men. This has increased by 19% since 2001 when there were 5,476 deaths.In 2006/07, there were 57,142 NHS hospital admissions in England with a primary diagnosis specifically related to alcohol. This number has risen by 52% since 1995/96"
In failing to implement pricing of cheap supermarket booze the Labour Government, when presented with these stats, rejected the advice of virtually the whole scientific and public health community based on the accumulated international evidence that the price of alcohol is one of the principal influences on levels of alcohol consumption and harm. - Most interesting politician: for sheer unreconstructed love of life and refusal to abide by others perceptions / rules, it has to be Simon Burns, MP: he is the health Minister who likes a drop, is often found having an early morning cigarette, or several, when I arrive by bike in Westminster, and who confessed to me, "I have always loved Hilary Clinton." He was mortified when I said she might have had a small amount of plastic surgery. - Biggest regret: missing out on meeting Barack Obama as I was ill. Getting to meet Bill Gates, Kevin Keegan, and getting to go regularly to 10 Downing Street are 3 good alternative consolation prizes. - Future Prime Minister from the new intake: Stella Creasey for Labour, who is the star of their intake, and Nadhim Zahawi, who is the star of ours. Duncan Hames is best of the new Liberal MPs, although Gordon Birtwhistle is the nicest Liberal I have ever met, and I really hope he holds on to his seat in Lancashire. - Best Moment in the House: either making my comeback at PMQs, which was petrifying but very exciting, or the Bowel Cancer Debate, which really advanced the screening debate and featured the famous incident when I cut my tie in two in the house [watch the debate below - it is lower down on the blog on the 30th november - there was a good reason]. - Most impressive MPs in the House: David Miliband is streets ahead of the rest of the Labour MPs - he gave a masterful speech in late November. Michael Gove is amazing at the despatch box, but Cameron's range of knowledge, stamina and speed on his feet has to be seen to be believed.
" The ultimate measure of a man is not where he stands at moments of comfort and convenience but where he stands at times of challenge and controversy." - Best Royal Wedding Moment: I watched the royal wedding from a front row seat in St Thomas Hospital in Westminster, when ill, dressed in loaned doctors scrubs. Having been ill in 2011 health is the one thing I do not take for granted and I wish you all health and happiness this holiday. I am heading home to a Christmas surrounded by family and friends. This Christmas spare a thought for the dozens of people who will be taking refuge at the Salvation Army Centres around the country. The S.A Centre in Central Newcastle is a wonderful place and I was lucky enough to meet the ladies who run it with great good humour, sensitivity and warmth. They will be working all over Christmas looking after their residents. All Conservative MPs received the following letter from the PM this week and I have only now had a chance to sit down and read it. It is good both to show his style but,more importantly, to show what the Coalition is trying to do and has physically done. At a time when some people question what has been done this is pretty impressive list of achievements. biggest cash rise since 1948.
been under Labour (HM Treasury, Autumn Statement, 29 November 2011). March Budget, 23 March 2011). 7. Getting credit flowing to small businesses and creating Enterprise Zones. Health Bill Impact Assessment, 8 September 2011). afford themselves (HM Treasury, June Budget 2010). with key suppliers (Cabinet Office, Press Release, 1 August 2011). environment (DCLG, Press Release, 30 September 2011). focus relentlessly on driving up efficiency and shedding bureaucracy. interfering with their operational independence. 2011 and 4 October 2011). without providing 24 hours notice (DfE Press Release, 15 November 2011). treaty without safeguards wasn’t right for Britain, so we said no. Last day before Xmas break but time to report on the really good meeting I had the day before yesterday with representatives of the Prudhoe firm Hammerite - whose paint and outdoor coverings are used both locally [Prudhoe Castle First School, the Allotments and the High School are just a few of the examples] but the company nationwide also provided most of the paint that was used to cover all the buildings at the 2012 London Olympic Buildings. I am hoping to go round the factory in January or February and meet everyone there. European leaders have failed to fix the Eurozone crisis: the latest stop gap is yet more borrowing. I am pleased that we are not providing any more IMF Bailout funds, but disappointed that the European leaders have still failed to use their own funds, which are held by the ECB, to resolve this crisis. - Then on June 21st 1790 Thomas Jefferson invited Hamilton to dinner. Hamilton went despondent but noticed James Madison and others had also been asked. The result was the most famous dinner party in history: the deadlock was resolved by compromise - the assumption tax was agreed to with the ASmerican version of the ECB taking all the debt, and the northerners agreed to move the USA capital from Philadelphia to the banks of the Potomac = Washington DC, in 10 years time. FIRSTLY: use the European Central Bank as the bank of the last resort to absorb all debt - it has the firepower to do it. This will stop the Euro crisis and boost confidence, albeit there is an inflationary side effect. SECOND: cut Euro spending, and ease debt repayment interest rates and provide innovative taxation abilities to Euro countries to stimulate the economy and get money coming in - the successful example of Ireland's low corproation tax is but one good pointer. 30 years next year our brave troops retook the Falkland Islands after the Argentinian invasion - many lives were lost on both sides. Next year, in particular, we will remember the troops who we lost. The Argentinian President has been stirring the pot lately as she tries to ensure her re-election. She forgets one thing: all of the Falkland Islanders want to stay British. I met with the representatives of the Falkland Islands Association in October, and support them 100%- I have not been myself but hope to remedy that in 2012. My thoughts at Christmas, in particular, go out to our troops providing the Islands with protection, led by Brigadier Bill Aldridge, of the Royal Regiment of Fusiliers. 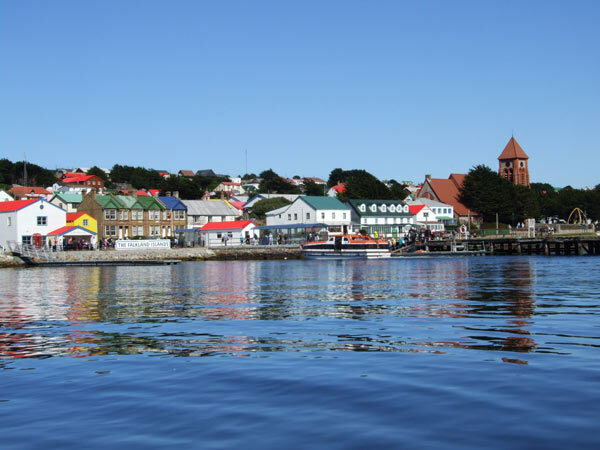 If you have not been to the Falklands go soon - it is an amazing place and Falkland Island Holidays [findable on the web]can help with tourism. Beautiful day in London, so cycled in, but now stuck alone in my shared office [7 of us, including two MPs, work in room 101] our 22 foot by 17 foot fortress on the embankment a 5 minute sprint from the chamber -everyone else gone home; and my desk is still piled high with correspondence. Determined to make a big push to finish everything tonight and over next few days before xmas. Also, my last 100 or so xmas cards are still looking at me saying "write me!" This week, a group of 19 doctors and academics wrote a letter to the Telegraph urging the Government to take “bold action” and follow the lead of Scotland by bringing in minimum prices for alcohol. They say the move could prevent thousands of deaths from alcohol related diseases every year. What really worries me is that we are moving away from responsible drinking in pubs to people buying large amounts of cheap supermarket beer and lager, which not only damages our local community pubs, but can also mean an increased alcohol intake with the knock on health effects. Supermarkets are being very unscrupulous and selling heavily promoted cheap larger with little regard for the aftermath. The Coalition has made some progress and has already banned supermarkets from selling alcohol at a loss. However even with this action it means that lager can still be sold for as little as 38p a can. What I want to see is a proper debate both locally and nationally about the benefits of a minimum price per unit of alcohol. It's something I have spoken about in the House of Commons, and with statistics from the Royal College of Physicians suggesting that a 50p minimum price per unit of alcohol could save nearly 10,000 lives a year, I am inclined to support the idea. Metal theft is a real poblem at the moment, especially copper. We have fallen victim to thefts in Tynedale as of late and its a matter I have recently raised with the Chief Constable. The problem was hammered home recently with the news that thieves struck a hospital in Wales on Tuesday, an action condemned as "dangerous and irresponsible" by hospital bosses. The thiefs had targetted a generator which ensures the hospital does not lose electricity if there is a power failure during operations. The theft at the hospital meant that 50 patients had their operations cancelled, including two who were due to undergo breast cancer surgery. This most certainly isn´t a vicimless crime. The government is taking steps to tackle this problem. Its not soon enough. Just a quick note to thank everyone who has been supporting the bid for a new high school building for Prudhoe Community High. We were hoping to hear by the end of the year if the bid was approved but we should now know by early next year if the bid has been successful. The matter is now in the lap of the gods (or Michael Gove as we call him)... but in all seriousness the department are going through all the bids in detail and there is a proper process to be followed. I met with Michael in his office in the Department of Education in Great Smith Street on Tuesday and remain very hopeful. Fingers crossed we meet the criteria. Simple Question - is Ed Miliband even the best MP in his own family? Yesterdays PMQs were the Leader of the Opposition's worst in a long time. I stood in the aisle between the Liberal Chief whip, Michael Moore and several Labour MPs. Camerons retort that "Its not like we are brothers" hit home and visibly deflated Labour who clearly would prefer David Miliband or someone else to be their leader. I took a keen interest in the report published by retail guru Mary Portas this week: commissioned by the Prime minister she has looked at how we can help our high streets and market towns. I was keen to read her proposals and found myself agreeing with many of them. Vacancy rates in market towns have doubled in the last few years as stores have closed down due to the economic downturn. “I believe that our high streets can be lively, dynamic, exciting and social places that give a sense of belonging and trust to a community." Ms Portas says. One of the strongest recommendations in the report was highlighting the importance of parking to market towns. Why when everyone s feeling the pinch will people pay expensive rates to park and shop in Hexham and Prudhoe when for many it's just as easy to go and shop for free at the Metrocentre or Asda? This an area where the council could make a real difference very quickly. Northumberland Conservatives have launched their proposals for a Peoples Parking Pass which would give all residents in Northumberland a permit to park for free. Not only is this fair for our residents but it would be a huge boost to our small shops and market traders across the county as local people would be incentivised to shop locally. It's a policy I hope the ruling Lib Dems on the County Council will adopt. As an MP I am a big believer in action as well as words. It's all too easy for MP's to talk a good game but stand back and let others do the work. A big part of that is getting involved in campaigns, whether its putting on my wellies to join the protestors protecting the greenbelt in in Ponteland or organisining a public meeting to give the victims of the councils equal pay failures a voice. As part of that I am a strong believer in Social Action. 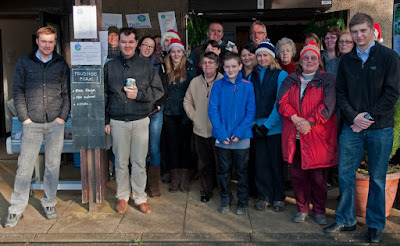 This year I have supported a number of projects with my team of volunteers through the Grassroots volunteer network, lending a hand to green groups and community gardens giving them a hand to help spruce up thier projects. My charity walk of Hadrians Wall this year was a gruelling one but well worth it raising over £4000 for charities including Tynedale Hospice. This Christmas I have been collecting children's toys for the Salvation Army. There are just a couple of weeks to go until Christmas and we asked anyone who could to buy an extra toy which could make all the difference to those children who are less fortunate on Christmas Day. I know everyone is feeling the pinch and money is tight but the response was amazing. Each gift was a small gesture which can mean the world to a child who has little to look forward to this Christmas. Berwick Conservative's Anne Marie Trevelyan helped to co ordinate the project and together we were able to take along literally hundreds of toys and presents to the Salvation Army HQ in Newcastle last week. Sue the Centre manager took us around for a tour and we met some of the residents before handing over the toys. They will go to those most in need this Christmas and I hope make a special Christmas for lots of children who might otherwise have a sad Christmas morning. Thank you to everyone who had been able to help out this year, we will be doing even more next year. Our son Martin has been at Oaklands care in Hexham for 20 years it was the only establishment that could help Martin. He is very content to call it his home. Martin attends Minerva school of which you support giving your time and money. You picked Martin's Christmas card as the one he liked the best for his charity Christmas Card this year. This has given Margaret and me something very special for Christmas. We wish the you a very happy Christmas and good health for 2012. The Minerva Centre does excellent work and is now 11 years old; the charity continues to be a great hub for people with learning difficulties. A special thank you to Frances for helping produce the Christmas Card which everyone thinks is great. The media are focusing on Nick Cleggs absence but the real issue for the country to decide is this: the decision to make the reasonable and modest demands of Europe were agreed by the Coalition. What would Labour do - time and again Labour were asked would you have signed this treaty? They will not answer. Ed is so firmly stuck on the fence he has splinters - he is neither for or against the strikes, nor for or against the Euro regulation or the treaty? It is easy to be in opposition as you never have the chance or need to make a decision. This is not an especially extravagant parody of Ed Miliband’s oratory style; time and again at the dispatch box he opens with quiet, detailed questions, then the occasion gets to him and he starts squawking like an excited chicken." - why are the Newcastle Council choosing to build, as their very first action, on green belt land, not brownfield land that it already owns or controls that exist in Scotswood or Walker? - what are the Council doing about the 5000 unused / empty homes in Newcastle. Why not tackle this problem? Could say lots more but after this meeting off to Gateshead and then meetings in Hexham later. He said he would only sign a new treaty if it safeguarded the interests of Britain and wouldn’t hand over powers or rights to the EU. The Euro countries, particularly France and Germany, would not budge so he did not sign. "The demands Britain made for safeguards, on which the Coalition Government was united, were modest and reasonable. They were safeguards for the single market, not just the UK... What we sought to ensure was to maintain a level playing field in financial services and the single market as a whole. This would have retained the UK’s ability to take tougher, not looser, regulatory action to sort out our banking system." Bear in mind Nick is a genuine and committed Europhile - and he describes our approach as modest and reasonable. This is part of the ongoing negotiation with the EU to forge a better relationship with Europe that is based fundamentally on trade. The Europeans still need to solve the Euro crisis: for me I am surprised and think it odd that we in the UK are regulating our banks in a more thorugh and better way, [through the Vickers reforms] and the european solution is for less regulation of banks. 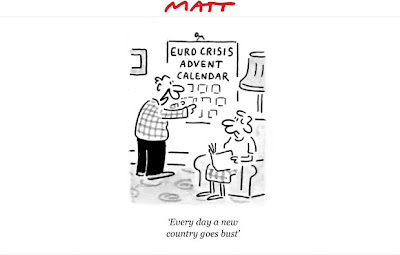 On this issue I am sure Cameron is right. My final comment is on the proposed Euro new Financial Agreement: the proposal they have adopted is that EU states will join a new fiscal arrangement aimed at stopping a repeat of the eurozone debt crisis. "For eurozone countries, it means they will have to enshrine in their own national constitutions tougher budget rules which were in the Maastricht treaty, but have since been broken. These include an agreement that structural budget deficits never exceed 0.5% of gross domestic product (GDP), sanctions for those whose deficit exceeds 3% of GDP and a requirement that they submit their national budgets to the European Commission." That is the whole problem of the Euro in a nutshell: do we really think some of these countries are going to live within their means, so that they have no debt ie 0.5% of GDP? And if they do go into debt the Eurozone countries will then fine them more money - to be paid out of debt? This is what got the Euro countries into the mess in the first place. You cannot have true fiscal union and a series of independent countries running their own finances. It is one or the other but not both - the last few years have proved this conclusively. A packed day in Prudhoe and Hexham - but the highlight was my visit to the Prudhoe Castle First School: I was shown around by 2 of the star pupils, and the Headteacher, and saw the rehearsal for the Nativity Play that the school are performing next week: this is going to be one Nativity Play that you do not want to miss - it is huge in scope, beautifully perfomed and is moving, genuine and very funny in parts. All I saw were the amazing efforts of the staff and the pupils themselves, and the supporting cast of Governors and PTA. This is an outstanding school. We recognise the need to ensure the long term financial viability of all sectors of english forestry. We will look to understand how effective grant schemes have been and how they could be improved. For example,we know that there are particular challenges to financial viability for small woodlands and we are keen to address these issues especially as small woodlands play a special role in many communities. However, we have also noted that profit is not always the primary motivation, particularly for small woodland owners. Information and advice services may have an important role in helping small woodland owners both to manage their woods and access markets,as might designing grant and certification schemes that appeal more broadly. In addition we will look at the potential for additional income opportunities to enable woodland owners to benefit from the delivery of public benefits, such as carbon or flood protection. our final report to the secretary of state next spring. different groups and test out their ideas. work to date, our initial thoughts about the sort of vision needed for forests and woods,and therefore for forestry policy in england. remain open to ideas and suggestions that our work may stimulate. There is a public meeting in Newcastle tonight to oppose the bizarre housing plans of Newcastle Council. Put simply they intend to build on greeen belt land, not brownfield first. Their plans, in particular, pose a serious threat to the greenbelt land between Ponteland and Newcastle upon Tyne, and elsewhere in Gateshead. I find the actions of the Labour council surprising. Newcastle City Council has put foward plans to build on land on the western edge of Newcastle between the A69 and A696, right next to the Newcastle / Northumberland Border. The Newcastle Council has named this area "Callerton Park" and identified it as Strategic Growth Area for 6,500 new houses. They intend this to be the first place for their new One Core Strategy for house building in the Newcastle and Gateshead areas. I am urging the Newcastle Council to have a re-think and withdraw the Callerton Park proposals. They are not intending to build on brownfield land first. Nor are they intending to fill unused empty homes. Their first action and first choice is building on the green belt, effectively in our back garden. This will significantly reduce the gap of green land between Newcastle and Ponteland. 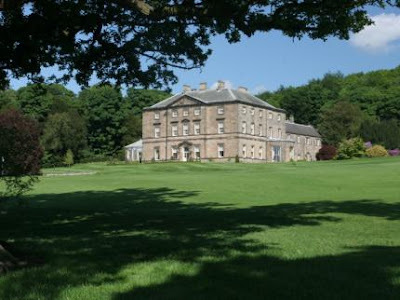 I think we can all agree that over the coming years Ponteland and Darras Hall will expand – after all it’s a fantastic place to live. I live near Stamfordham myself. However, any future development must be led by local communities. The local commnunity near Callerton Park is objecting to this and we should object to. Development that affects Ponteland should be done in harmony with the needs of Newcastle, after they have consulted our Ponteland town council, and done sensitively to local residents. What Newcastle needs, like many areas, is affordable sustainable development. You only have to drive towards the city centre to see a huge number of brownfield sites which could be developed and areas where regeneration has stalled for too long or even stopped. This is where they should build first. What no one needs is the council and big developers looking to make a quick buck off the back of a cash crop housing estate in the greenbelt surrounding our area. I am urging Ponteland residents to have their say on the plans, which are currently out for consultation via the Newcastle City Council website. The deadline to make comments is January 4. I urge you to have your say. Shopping locally for fuel and oil - "Use it or Lose it"
Regular readers will know we have been campaigning for ages on fuel poverty generally and specifically on fuel prices, and its availability in rural areas. There is good news that locals are combatting fuel poverty by using oil buying clubs, and also that the governement is looking in the House of Commons, and through the OFT, to combat the Irish company DCC, who have tried to monopolise the market, and generally at regulating off grid fuel supply. The other issue is the price of petrol and the need to support local garages. Last Friday I popped into the Chollerford Garage and filled up. The owner there, along with the owners of other local garages I have talked to, is rightly frustrated that some local people are not using local petrol suppliers but are filling up at supermarkets or in Newcastle. As always, with local suppliers the key issue is "Use it or Lose it". I would urge everyone to shop locally - not just in local village shops but also local garages and fuel suppliers. If we do not support them they will not be there for us when we need them. For example - a local tourist trade without local garages would be massively affected. Make it one of your christmas resolutions - shop local in every way! Yesterday the consultation about the proposed Boundary Changes closed. I am yet to find anyone who thinks it is a good idea to take Haltwhistle, the South Tyne and the South Tynedale region out of Northumberland and make them part of a Barnard Castle and Consett seat. This is nothing to do with self interest and everything to do with trying to preserve regional identities, at a time when we have lost our local Councils, and Westminster seems far further than the 315 miles away it actually is. My thanks to everyone who wrote in or came to the Boundary Commission hearing in Newcastle and made representations. We posted or hand delivered over 20,000 leaflets to almost everyone in the southern half of the County, asking them for their views and input. I thank you all for your hard work and response. We find out what the Boundary Commission think next Year - but we have certainly given them something to think about. Anyone who has ever met Graham Wylie will know he does not do anything by halves. Having made a fortune with Sage he has put a large amount of his money, and created hundreds of local jobs, by renovating and expanding Close House Hotel and Golf Club over the last 5 years. - If you want a great place to stay then the Hotel's 31 rooms, 8 miles from Newcastle, in stunning countryside, are a cut above. The Times last Saturday cited it favourably in their "Cool Hotel Guide", and rightly so. I quote from Neal Crocker, the very nice general mamager, who says about Graham: "He wanted better rooms than you pay £900 a night for in London", and the Times reviewer added, "everything did seem very upmarket and stylish - and a bit of a bargain with B+ B doubles from £150." I can add little more to the Times reviewer who states that "quietly one of Britain's best new country house hotels has taken shape. But it is far from traditional or stuffy." In short you would go for the hotel on its own. It is rightly described as the Gleneagles of the North East. - However, as everyone knows I am sport mad and the key to Close House is the incredible golf course: Lee Westwood is the visiting pro. Both Graham and I have been trying to tee up a grudge match between us two high handicappers, but I fear that our diaries will have to wait to the spring. However, I can assure anyone that there are holes on this course that anyone would want to play. This is a local project, run by a local man, putting his local money into lots of local jobs. This alone would get my vote. But as a fantastic hotel with all the trimmings, and a great golf course, in a stunning setting, overlooking the Hadrians Wall Walk and the River Tyne it has so much more going for it - I urge my readers to go before everyone hears about it. It is yet another reason why tourism to Northumberland is changing all the time. I am backing the Energy and Climate Change Minister Greg Barker's calls for pensioners and those on low incomes to make sure they’ve claimed for the help to which they’re entitled to keep warm this winter. The Government’s Warm Front scheme provides grants to people in poorly heated or insulated homes to pay for boiler repairs, new central heating systems and insulation work. People who received help through Cold Weather Payments (CWPs) last year may be eligible for help. Cold weather payments are given to pensioners who receive pension credit or people onincome-related benefits who meet certain criteria. Those eligible for helpcan apply for up to £3,500 towards the cost of the work or up to £6,000 for homes not connected to mains gas. “With the coldest months of the year fast approaching, there’s never been a better time for people on low incomes to pick up the phone and apply for a Warm Front grant. Getting a boiler that works better or even just topping up loft insulation can lead to awarmer, cosier home in the future. Over the next two years 90,000 people are expected to be helped byWarm Front adding to the 2 million helped since the scheme began in 2000. For those who are eligible the Warm Front team arranges a survey and ensures a package of measures is tailored to each home. The flakes are falling once again. Hope the gritters are out tonight. Spend most of yesterday at the fantastic Prudhoe Christmas Bazzar before heading back to the office to catch up some work. Well done to Andrew Jones and everyone who helped organise the day. Every week Prudhoe is becoming a stronger and more vibrant community and it's great to see it thriving. I managed to pick up some cracking Christmas presents too which is a bonus -and was given a couple of Prudhoe Coffee Mugs, one of which I am holding in my hand. Hexham Hydro - we win! HAVE YOU VOTED YET - PLEASE DO!! However, we need your votes. I know 15,000 + of you follow this blog - get your fingers moving: we need to prove why we are the biggest and best blog in the North East. Up early tomorrow and off on the train first thing to Hexham. Speaking at a big dinner in Wansbeck Friday night, then spending most of the day in Prudhoe Saturday - make sure you come to the Prudhoe Christmas fair, which I am really looking forward to. Also, have to sign and sort just over 1000 christmas cards - although this is always a pleasure as a group of us hole up in a warm house in Humshaugh this weekend, and work like feverish postmen to get the job done. Apologies if you get the 1000th card I sign as my handwriting might begin to disintegrate by then! My thanks to the Minerva Centre, who I have supported by buying all the xmas cards from [do not worry I pay for this not the taxpayer]. 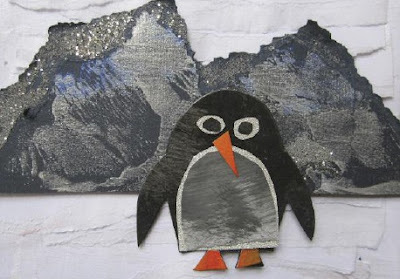 They are an inspiring centre based in Hexham: their mission is to help those with different learning abilities realise their full potential as individuals by providing craft, design and general art training. They aspire to develop individual strengths and build on self-esteem and self-confidence through the courses and practical work experience offered. 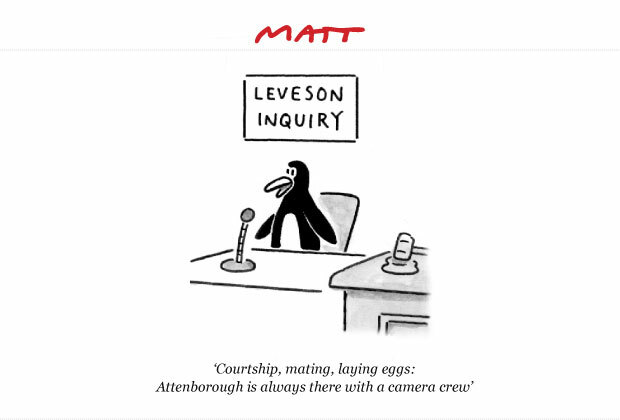 Two themes for today: Matt's cartoon combines the amazing BBC Frozen Planet Series but also the degree to which the press intrudes into peoples lives: today parliament is debating BBC budgets. Every day the Leveson Inquiry into phone hacking takes place in the High Court in London - with ever more revelations of lives turned over by the tabloids: whether it is the McCanns or the Dowler family, it is clear that reform is going to to come at the end of this inquiry. However, the BBC is attempting to cut local radio and local TV. This is manifestly wrong when they are spending a fortune on some national TV content. Do not get me started on the £17 million paid to Jonathan Ross or the salary of BBC Director General which is around £779,000, plus expenses. This is about 5 times the PMs salary and the General of all our armed forces. I am going to try and speak in todays debate but may struggle to get in: you still have the chance to influence the BBC - write to them at Broadcasting House, Portland Place, London, W1A 1AA. Write in to the BBC and have your say!